Three college and three high school teams remain as finalists in a national contest to pick the best three-dimensional printing design. 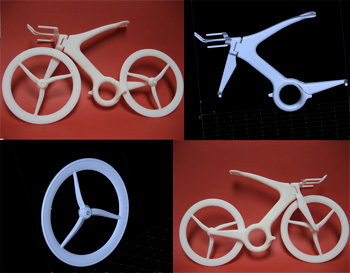 The competition, sponsored by computer-aided design firm Dimension 3D Printing Group, required the contestants to identify an existing product or piece of art or architecture and redesign it, while improving the original with new functionality or qualities. The finalist where chosen from a pool of more than 1,200 design entries, more than twice the number of entries submitted for last year's competition. First place winners will each receive $2,500 scholarships, with second and third place finalists receiving $1,000 scholarships each. Final contestants from the University category are Megan Weber and Katie Stephens (Saddle III) of Hobart and William Smith Colleges, Geneva, NY; Mike Kochman (Off-Road Cell Phone Carrier) of Columbus State Community College Columbus, OH; and Harald Kramer (Time Trial Bike) of the HS-Magdeburg-Stendal, University of Applied Sciences, Magdeburg, Germany. Winners will be announced during a live webcast award ceremony Wednesday, April 4.